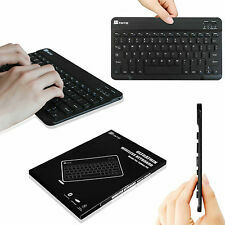 Wireless Bluetooth Keyboard for Tablets and Phones. Compatible with Android, iOS, Windows, and other Smart Devices. 1x Wireless Bluetooth Keyboard. 4, switch on the Bluetooth keyboard, (press the BT button on your keyboard, The Blue Light Will be Blinking. ). 1 Year Warranty - Best Accessories, Best Shop 4 U! Keyboard for Apple & Android Tablets Anker Bluetooth Ultra-Slim White (A77726)™. Shipped with USPS Priority Mail. It is compact and very lightweight, easy to pack and take on the go. ** NEW OPEN BOX ** out side box has some damage but keybord is new!